The partnership of Cancer with Cancer is characterized as the best friend and worst enemy. On the one hand, representatives of the same sign have much in common: one for two, the elements of water, the same temperaments and characters, similar views on life, hobbies and life guides. Who, if not them, know each other about everything and build strong, stable relationships on this basis. On the other hand, the same poles of the magnet always repulse: so the partners can not withstand the negative traits of each other, with which both are endowed. The success of the relationship in such a pair will depend on the position of the other planets of the personal horoscope of each of the participants. Cancer is a very delicate, gentle nature, which most of the time is in its fantasies, dreams and the strengthening of its home-fortress. His sensitivity leads to excessive reactions to any situation and phenomenon, and this provokes a frequent change of mood, desires and emotional instability in general. Cancers are rarely confident, so they move slowly, weighing each step, and in case of threat they hurry to hide in the depths of their shell. They are introverts and rarely gather around themselves big noisy companies. In life, they settle for one or two friends, but they are devoted and time-tested. Most of all in life Cancers value a sense of security and stability: they show this quality in all life spheres. They can work for decades in one place, make friends with a single person all their lives, try to create a marriage that will last a lifetime. From this perspective, the compatibility of Cancer and Cancer can be very beneficial. In the partnership between them harmony and idyll reigns, as both trust each other and sincerely try for the good of their relations. They like to take care of loved ones, give them warmth and tenderness. A couple where both partners try to please each other is, in theory, doomed to a happy existence. But at the same time, the sign of water is highly sensitive and vulnerable, so only one careless word from a partner can offend him. Offended Cancer crawls into its shelter and it is extremely difficult and sometimes impossible to get it from there. He will only wait until he himself deigns to get out. Now imagine what will happen if the two Cancers take offense at each other at the same time: both will lock themselves in their shells, and no one will want to take the first step towards each other. In such a situation there is a high probability that their tandem will cease to exist. 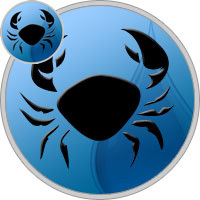 Therefore, the horoscope of compatibility of Cancer with Cancer can not unequivocally confirm or deny the success of their pair in long-term relationships. The compatibility of Cancer and Cancer in the work can be very fruitful. The sign of the water element is endowed with creative potential and is able to create successful large-scale projects. In captivity representatives of this sign do not work very well, they need to have a personal space and freedom to translate their ideas. Such a couple can be successful in a joint personal business. It would be nice if partners were of different ages: after all, the more there is a difference between them, the more they can bring to the common cause. Cancer with Cancer compatibility in friendship is very high. Such relationships can last until the end of their lives. They are devoted comrades who will always help a friend in need, they love to surround with the warmth and care of their relatives. Similar views allow them to find many common activities and hobbies, so they will not be bored. They can talk for hours about something their own or just silently watch their favorite movies. Confidence in relationships entails complete openness: there are no secrets between them. Heterogeneous friends often turn into lovers: a love union built on the basis of a friendly, as a rule, is long-term and strong. A high level of compatibility of Cancer and Cancer in love contributes to their internal similarity. They are incredulous and vulnerable, and therefore appreciate the careful treatment of themselves and their close people. Having met, two romantic and quivering Cancers will plunge into their own, jointly created, ideal world where love and harmony thrives. They will make a friend pleasant gifts, walk under the moon and midnight to correspond by SMS. Representatives of the water element have a developed intuition and sensitivity, due to which they clearly know what the partner needs. In most cases, such couples reach the wedding palace. Cancer’s compatibility with Cancer in a relationship is overshadowed by the fact that both are extremely touchy. And instead of solving the conflict amicably, they hide in their shelter, where they can long lament the injustice and cruelty of this world. Despite all his love for the loved ones and caring for them, Cancer is a big egoist, because he is too concerned about himself. Love for one’s neighbor has a hidden motive — to receive in return the same warmth, affection and sense of being meaningful. The partnership will be more successful in two cases: in a couple where the Cancers have a big age difference and then the older, more mature partner will take on the role of guardian and will indulge the younger’s whims. Or in a couple where both partners have reached maturity and have learned to control their emotions. Two young Cancers can one day quarrel and never meet again. Compatibility Cancer with Cancer in bed is close to ideal. They behave secretly in ordinary life, but they fully reveal themselves in an intimate atmosphere before a loved one. Cancers, thanks to their rich imagination, are interesting lovers who constantly invent something new to get and deliver unforgettable impressions and sensations to the partner. Two Cancers will never be bored under a blanket. Intuition and sensitivity allows them to feel a partner and give him maximum pleasure. A stumbling block may be their sharp mood swings, which often happen by themselves, for no apparent reason. Sometimes even the representatives of the water element themselves can not explain this phenomenon. The dissatisfaction of one partner can provoke a quarrel directly during sexual pleasures. Both need to learn how to control their emotional background and at the same time treat their partner with condescension, if suddenly his mood deteriorates sharply at the most inopportune moment. Compatibility of Cancer and Cancer in marriage, as a rule, high. Spouses always look like two lovers, cooing pigeons, no matter how much they lived in marriage — a year or ten years. Mutual care and courtship are observed in their relationship throughout the marriage. In their house it is always warm, cozy and smells of home-made pies. For Cancer, the family is vitally important: each of them strives for a stable and lasting union. The sign of water will take care of the house and its inhabitants throughout life, since it is there that it feels safe and comfortable. "My house is my fortress" is a slogan that can become the motto of any representative of this sign. Compatibility Cancer with Cancer in family life promises to be high due to the fact that they are very fond of children: and the more they are there, the better. In such pairs, two or three offspring are often born, for which the Cancers become loving parents and good friends. Their desire to increase the number of family members also has its logical explanation. In the environment of loved ones, any Cancer feels comfortable and safe. And what else can you wish for?